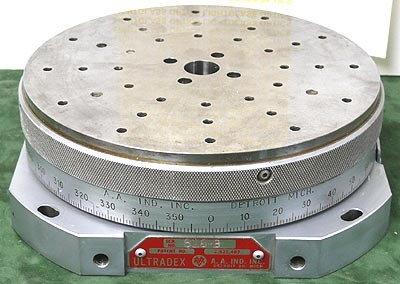 The 7" Ultradex Rotary Table, Model B is the ideal Optical inspection tool, due to its simplicity of design and extreme accuracy. Utilizing interlocking teeth (a Hirth Double Coupling-very similar to the teeth on a crown gear) the table is setup to go in 1 degree increments. The accuracy of this is 0.5 arc-seconds, and due to its design, tends to get even more accurate with use! This is not a machinists rotary table, with a worm gear, and in fact would be a poor choice for machining. The strength of the Ultradex table lies in its accuracy for inspection- verifying prism angles, optical cubes, optical polygons, etc. The table has a lever which raises the top table, freeing it from the bottom gear, and allowing rotation. Once you have mounted the item to be inspected by means of the multiple drilled and tapped holes on the top, and verifying it is perpendicular by using an alignment telescope, you can rotate the table to any angle- say 90 degrees- use the lever to lower and lock the table- then see if that prism or cube is actually 90 degrees or not. Even if the angle you are trying to check is 237 degrees- or any face in one-degree increments- the Ultradex allows you to check it. The 7" table is the most versatile of the Ultradex tables, as it is light enough to be still portable, but big enough to accept a fairly heavy optical element. This comes with a heavy-duty Pelican case for protection. Made by AA Gage, Under the A.G. Davis Company.